Protecting the privacy of people and information featured in the content you post on your social media accounts can be vital for their security. What’s more, if you don’t have a permission from a person in a photo or a video to use it publicly, the only other option you have is to conceal their identity. You don’t have to use PC or Mac-based image editors in order to anonymize images, because there are plenty of online platforms that let you hide sensitive parts of the picture in only a few short steps. In this article, we are going to take you through some of the best online platforms that offer powerful tools for blurring faces and we’re going to show you how to use these tools to edit your images. We recommend you to try the FilmoraPro to blur faces on Windows and Mac. With FilmoraPro - Filmora's video editor for pro , you can select the blur shape, position and pixelate size as well. Besides, you can blur several faces in the video as you need by adding Witness Projection effect to the video. With this professional video editing software, you can do more and be more creative with FilmoraPro. Watch the video tutorial below and download the free version to have a try. Before you choose a platform you want to use to blur faces in your images or videos you first need to check the size of the file, since some online tools may have a file size limit. Even though online photo and video editing platforms offer support for a wide range of file formats, checking the compatibility of your images with the online image editor is advisable, since it may save you some time. Let’s take a look at some of the best online solutions for concealing private information. This privacy image editor offers a quick way to blur faces in your photos because it features a face detection technology which automatically detects faces. You can choose from Pixelize, Blur and GF settings that conceal faces immediately after you select them while selecting the Manual option enables you to choose which part of the image that is going to be pixelized, blurred or completely blacked out. Facepixelizer also offers the Crop option, that lets you remove all unwanted parts of photos, so you can easily control which segments of the image are going to remain in the final version of the photo. 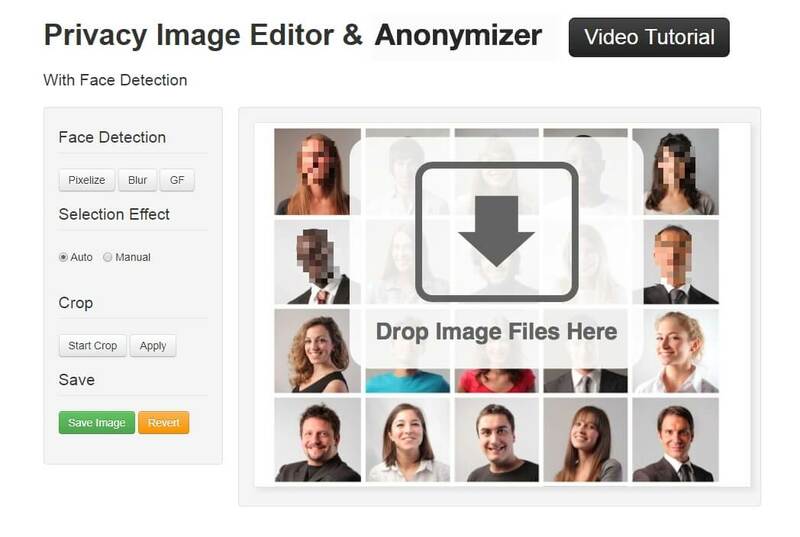 In order to start anonymizing a photo, you just have to drag it from a folder on your computer and drop it to the designated spot in the editor’s window. Afterward, you need to select Blur or Pixalize option, crop the picture if you want and click on the Save Image button. The wide range of photo and video editing options, this online image editor provides, make it one of the best options for concealing private information. You can upload pictures from your computer or from Instagram, Facebook, Dropbox, and Google Photos or URL ect. LunaPic also offers basic video editing options, but it doesn’t let you upload videos larger than 100MB. To blur face with LunaPic is easy, after you’ve uploaded your photo or video file to this platform, go to Draw option and then select Blur a face to entering the face blurring interface. You can choose to blur a face only, or blur multiple faces by select the target objects that you want to hide and then click Apply Blur button to add the blurring effect. The Video Editing option is located in the Animation menu, and by clicking on it you will be able to import a video file or an Animated GIF into the LunaPic image editor, so you can easily blur the faces in your videos. 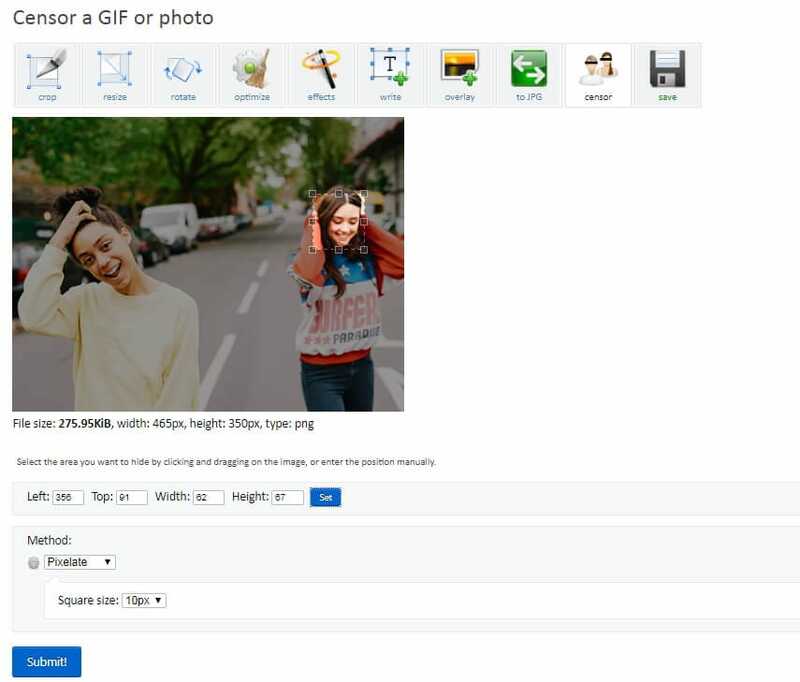 Ezgif is one of the most popular online destinations for the creation of GIF files. The Censor option is designed to enable its users to conceal faces effortlessly. After you click on the Censor GIF feature in the Effects menu, you’ll be asked to upload your photo or GIF. 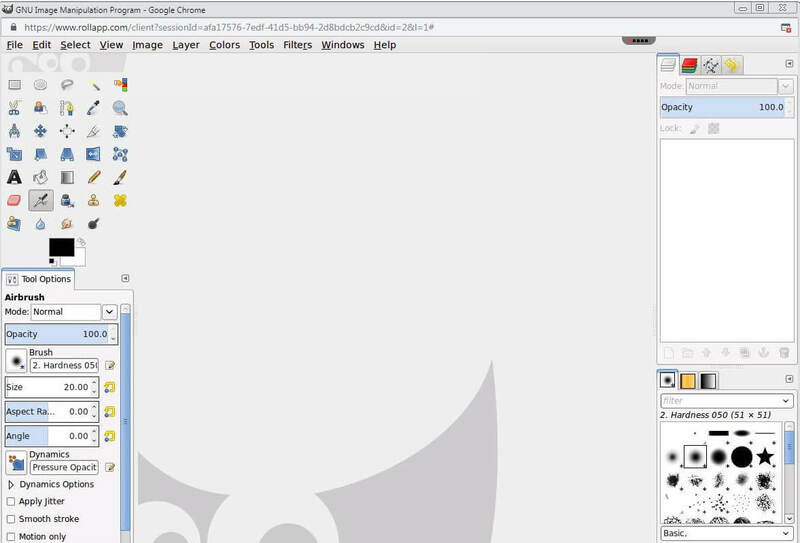 When the file is uploaded you just have to hold the left mouse click and drag the cursor to select the part of the picture you’d like to blur. Alternatively, you can insert new values into Left, Top, Weight and Height boxes and click on the Set button to confirm the changes. The Method drop-down menu lets you choose between Pixelate, Blur, and Solid Color options, so you can select the one that is best suited for the effect you’re trying to achieve. When done, hit the Submit button and the editor will display the results below the original image which allows you to preview the result before saving or sharing. Click on the Save icon, located under the blurred image and choose the destination on your hard drive where the new photo or GIF are going to be saved. The PineTools platform features a wide range of tools organized in different categories, such as Mathematics, Programming or Images. Clicking on the Images category will grant you the access to all photo editing tools this online platform offers. Sharpening, resizing or colorizing images are just a few among the numerous options you’ll have at your disposal if you choose to edit your photos with PineTools. The Censor Photo feature is fairly simple to use, as you just have to upload a picture, define the area that needs to be concealed, and choose either of the Pixelate, Blur and Solid Color options. If you select the Pixelate method you’ll be able to adjust the Block Size slider, while choosing the Blur method will enable you to adjust the Radius. If you opt for the Solid Color method you will be asked to choose the color of the layer you’ll be adding to the photo. Even though this famous open-source software is commonly used on Windows, Mac and Linux operating systems, there are several ways you can use it in your browser. Creating an account on Turbo.Net or rollApp platforms will enable you to hide information in your photos without installing this photo editor on your computer. Like all powerful photo editing software products, GIMP offers a quick and easy way to blur faces in your photos. You simply have to import a photo into a computer-based or online version of the software and use the Ellipse tool to select a person’s face. You can find the Pixelate effect in the Blur submenu of the Effects menu, and you should just click on it to bring up the Pixelate window. Adjust the Pixel Width and Pixel Height options and confirm the changes by clicking on the OK button. Optionally, you can use the Blur or Gaussian Blur effects that are also located in the Blur submenu to conceal the faces of the people in your photos. Possessing advanced photo and video editing skills is not mandatory if you would like to hide private information in images you use publicly. Each of the online platforms we presented in this article is easy to use and requires you to invest minimal effort to blur faces in photos and videos. 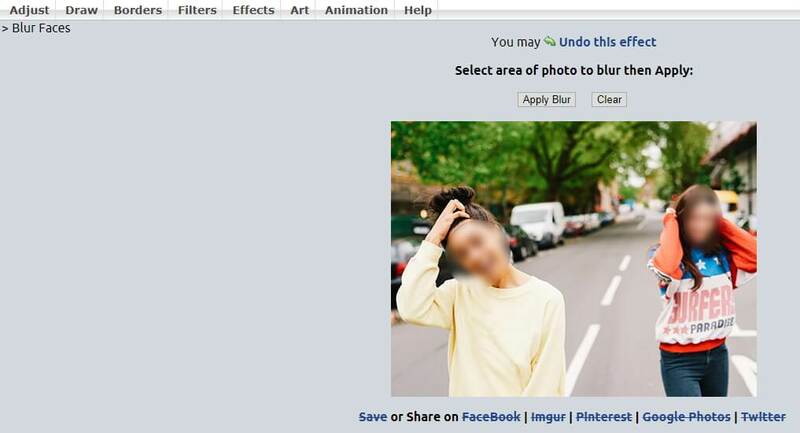 Do you often blur sensitive parts of images online? Leave a comment below and let us know which online photo and video editor is your favorite.